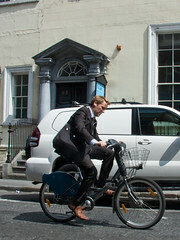 I was in Dublin two weeks ago, for the Cycle Chic fashion show, sponsored by the Embassy of Denmark and Dublin City Council. 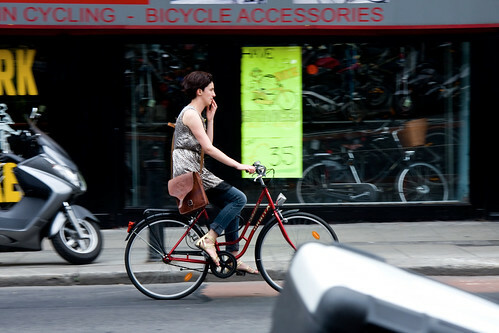 I can say that I was stunned by the numbers of Citizen Cyclists on the streets and bike lanes of the city. Absolutely stunned. It was brilliant to see. Not just commuters, but citizens using the bike for short trips. Bikes parked outside flats. Bike racks filled near shops. ... so perhaps the journey back to the bicycle is not that strenuous. Who knows. What is certain is that there are positive forces at work in the city. 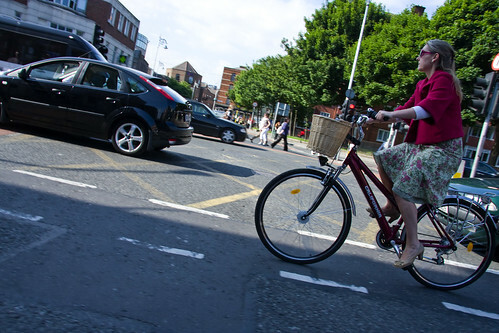 The two main reasons for the wonderful levels of cycling are both the work of City Councillor Andrew Montague. 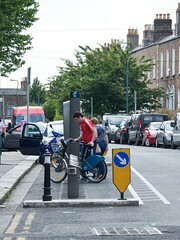 He brought the city's bike share system - Dublinbikes - to the streets and he implemented 30 km/h zones in various areas. Both good measures to get bicycle culture going again. 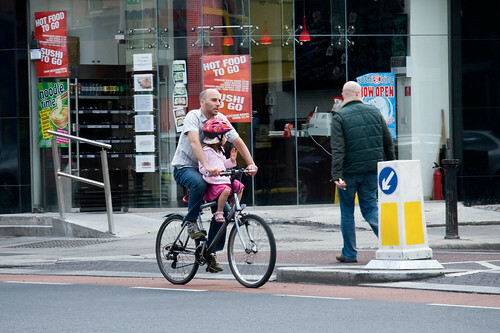 City Cycling Officer Ciarán Fallon works hard for the same goals. 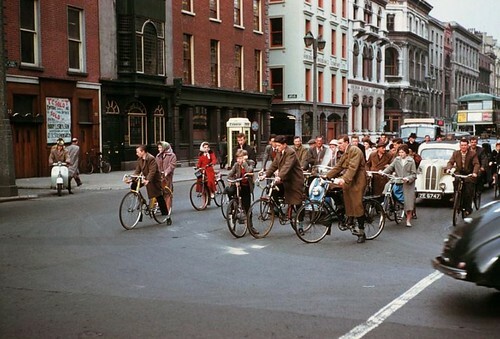 Here's the Dublinbikes in action. They've been a massive success. The expected number of subscribers was set at a modest 1500. There are now over 30,000! There was a positive sign only metres after getting off the plane at Dublin Airport. I snapped this out of the window as I headed for arrivals. A bicycle lane. At the airport. 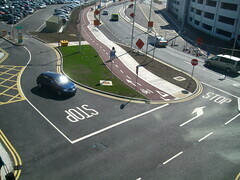 I'm assuming that it is primarily for use by airport employees to get around - feel free to fill us in, Dubliners. Nevertheless, it is great symbolism. Heading into town, more bicycle lanes appeared. I was travelling with Sussi, from Biomega, and I was staring at the painted lane for a while before I realised that it was bicycle infrastructure. "Hey... is that a bike lane?! ", I was heard to remark. 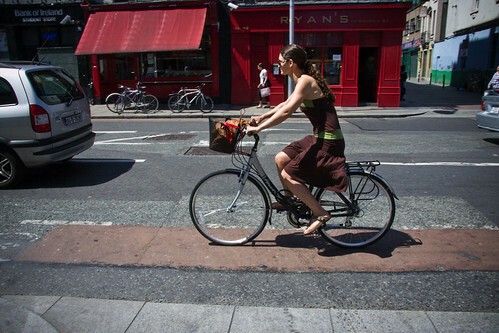 The mere fact that Dublin City Council and the national government backed a Cycle Chic event shows that they all are thinking out of the box and eager to embrace Bicycle Advocacy 2.0 in order to mainstream urban cycling. All the players feature in this film about the Cycle Chic event. 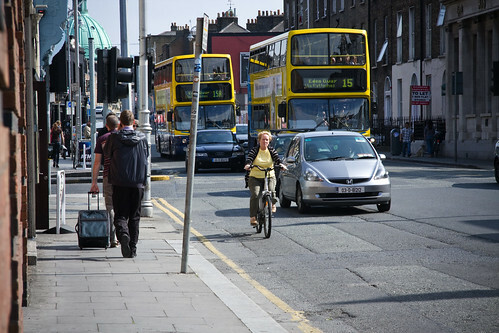 The infrastructure was primarily painted lanes, but that is a brilliant start and clearly the citizens of Dublin felt safe enough to use them. There was a general level of traffic calm throughout the city centre. Where there was infrastructure, it was used. 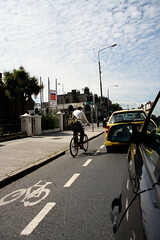 Where there wasn't, the cyclists - being regular people on bicycles - were cool about it and riding sensibly. Like I often say in my presentations, when you get higher levels of non-sub cultural cyclists, they behave much like pedestrians. 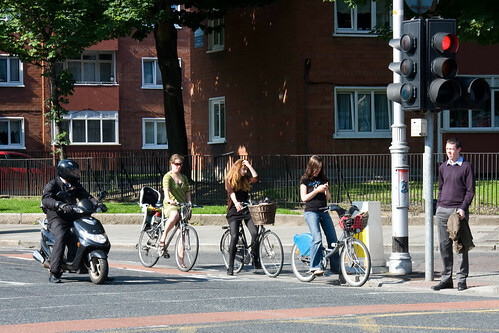 I hardly saw anyone blowing agressively through red lights, and certainly not cyclists like these ones. I've been asked a few times in interviews about what the Next Big Thing is. The next city that will muscle it's way from single digit modal share to, say, 15%. I have been working on the Copenhagenize list in my head for a couple of months. At the moment, Dublin ranks high on the list. Well done, them. Brilliant stuff.